The Family Resource Center was created to reinforce the Children's Center Preschool mission of supporting parents and caregivers. We offer a family resource library, a speaker series tailored to the concerns and needs of our parents, guest performers for families to enjoy together, and a variety of parenting groups. These are free of charge and open to the community. We proudly offer speaking presentations where professionals share their knowledge on a variety of topics, such as discipline, sibling rivalry, friendships, raising girls, raising boys, and building resiliency. All of our speaking events are free. 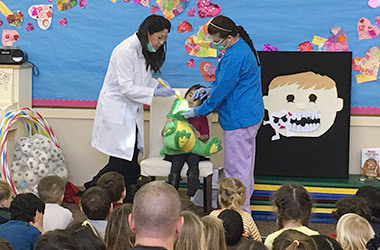 We also provide enriching assemblies for the children, including visits from valuable community members — firefighters, police department, dentists, children’s book authors, and cultural dancers. Click here to learn about upcoming events. 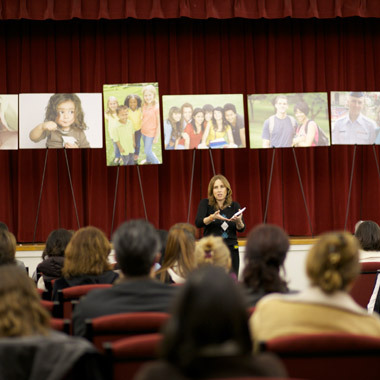 These smaller, informal gatherings offer you an opportunity to meet and connect with other parents while listening to speakers discuss a variety of parenting concerns. Past topics include: "Mindfulness: Taking the Stress Out of Parenting", "Behavior 101: Avoiding the power struggle and understanding your preschooler's behavior," "Separation Anxiety," and "Helping Your Preschooler Build Self-Esteem and Autonomy." The events take place in the morning on school days. Coffee and refreshments are served, and childcare is provided in the church nursery. Click here to see what's coming up! We believe that participating in community outreach projects is a perfect way to begin instilling a lifelong awareness in your child about the importance of helping others in need. We encourage our families to have their children be a part of the process. Children can help pick out food, books or gently used lovies to donate to those in need. Click here for recent and upcoming outreach opportunities. For more information please contact our Family Resource Center Director, Bryn Stuebner at brynstuebner@laumc.org or (650) 941-5411 x119.